Dyson Animal 2 Vs. Shark Apex DuoClean Upright Vacuum (Differences): Both Shark and Dyson have very capable uprights. 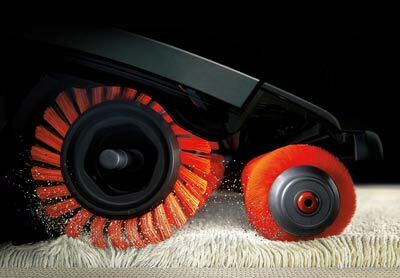 Both provide the suction and powered brushroll to clean carpets of dust, dirt and pet hair. Both are not lightweight vacuums, but heavy duty, high powered cleaning machines. All Dyson and Shark uprights are Bagless, where you empty the dust bin into a trashcan, with some of the allergens getting into the air. Dyson’s power cord is 5 feet longer. The Shark Apex AZ1002 has the new Zero-M technology to prevent hair tangling. Dyson has a unique tangle-free handheld turbine tool, which is great for pet hair. The Shark Lift-Away feature allows you to carry the vacuum around, while the Dyson uses a hose + wand. Dyson has a wider cleaner head than the Shark. The Dyson Animal 2 is usually more expensive than the Shark TruePet. What makes Dyson Unique- Main Differences: Dyson invented the cyclonic bagless vacuum, and has been an innovator in the bagless vacuum category. Dyson is also known for strong, powerful, suction. One area that Dyson stands out is its tools. One in particular is the Tangle-Free Pet Tubine Tool, which we believe is the best air driven tool for pet hair on the market. We have seen this tool demonstrated, and it can pick up long hair and even shoelaces without wrapping around the brushes. Dyson implements Ball technology for superior steering around furniture. The Dyson Ball Animal 2 has the highest suction any Dyson vacuum. What makes Shark Unique- Main Differences: Shark vacuums use a Lift-Away system, where the vacuum can be lifted off the body. Traditional vacuums like Dyson use a wand +hose off the main body. Shark has LED headlights in most of its higher end uprights. The Shark Apex AZ1002 uses a sealed system to contain dust & dirt. Zero-M technology prevents hair from tangling on the brushroll. The APEX AZ1002 has DuoClean brushes for both carpet and hard floors. The AZ1002 comes with a Pet Multi-Tool, which is a two in one brush + upholstery tool (the dyson tool has a rotating brush). Bottom Line: Both Vacuums have strong suction and are great for pet hair and both score a 4.6 stars rating. 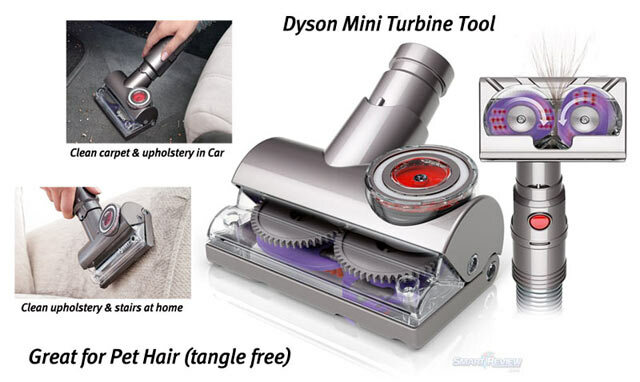 The tangle-free turbine tool from Dyson is superior to the Shark Multi-Pet tool. With Shark you get the Lift-Away powered canister, LED lights, and Zero-M technology. You cannot go wrong with either vacuum. Both models have won our BEST of 2019 Award for upright vacuums. Lift-Away Canister = Shark Navigator vacuums have a detachable canister on their uprights, so that you can vacuum stairs, and other hard to reach areas. Shark Zero-M Technology = The newest Shark vacuums have Zero-M, which actively removes hair and threads so they don’t wrap around the brushroll. Zero-M is available on the new Apex DuoClean AZ1002 Vacuum. 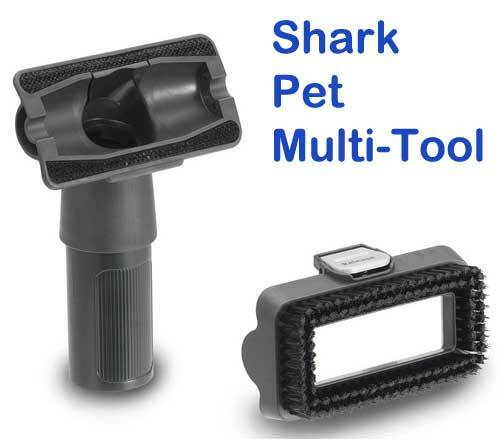 Shark Pet Multi-Tool = The Shark Pet Multi-Tool is a two in one tool that has a detachable stiff bristle brush. Once detached it becomes an upholstery tool to get stubborn pet hair. Shark Complete Seal Technology = Shark vacuums have sealed systems to hold in dust, dirt, pet hair, allergens from escaping the vacuum. Dyson Tangle-Free Turbine Tool = The newly updated Dyson tangle-free turbine tool helps prevent hair, threads, pet hair and other hazards from tangling around the counter rotating brushes which is the main difference when you compare this to the previous versions. Even shoelaces will not wrap around the counter rotating heads. Dyson Radial Root Cyclone™ = Radial Root Cyclone™ is the latest Dyson Cyclone technology , where airflows maximize suction power. These refinements can help remove more dust, pet hair, and allergens. The Dyson Animal 2 has the highest suction of any Dyson vacuum. Dyson Ball™ Technology = Dyson invented the Ball type of vacuum. The vacuum sits on the ball and is highly maneuverable around obstacles, much more so than a regular vacuum. The Dyson Animal 2 has Dyson Ball™ technology. Certified Allergy & Asthma Friendly = The Dyson Animal 2 and Multi-Floor 2 Uprights have been certified Allergy and Ashthma Friendly by the AAFA Foundation. Each vacuum is independently tested in accredited laboratories and proven to be more suitable for individuals with asthma and allergies in order to be recommended.